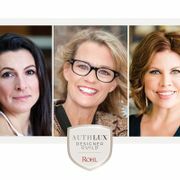 ROHL is proud to announce the creation of the ROHL Auth Lux Designer Guild and its inaugural members, Denise McGaha, Julia Buckingham, and Marcia Tucker. The newly created Designer Guild reinforces the value and appreciation ROHL has for the expertise of designers and trade professionals. Starting in June, each member of the ROHL Auth Lux Designer Guild will co-host a series of Summits in New York City, Chicago, and Dallas. The day-long summits will feature a variety of educational programming highlighting authentic luxury design. In addition to ROHL, guest speakers and partners include Pam Danziger, of Unity Marketing and a luxury market expert, Gaggenau and Rutt HandCrafted Cabinetry.